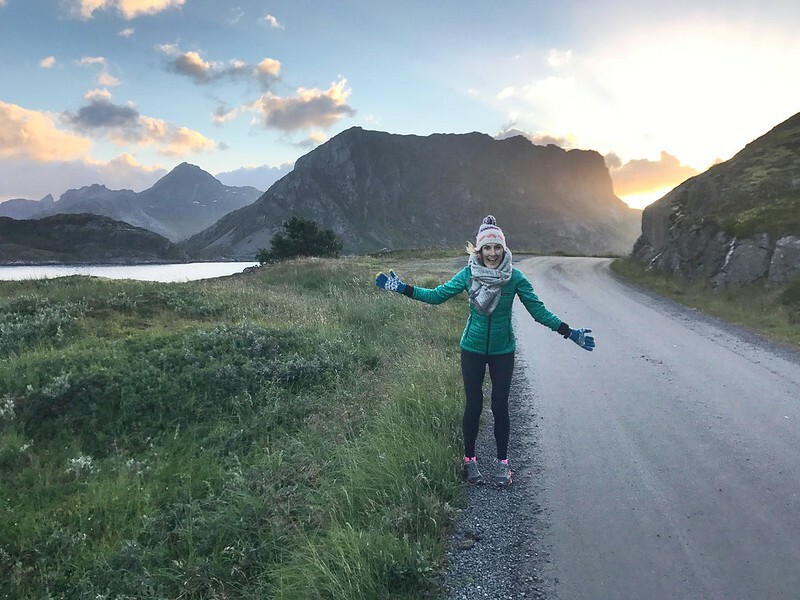 Posted on January 23, 2018 January 23, 2018 by Emily S.
Norway is a country that has been on my dream list to visit for quite some time. Fjords, mountains, ocean, sunsets, trees and a European country are all things I love. When we moved to London, this trip to Norway was one of the first things I began to plan. City breaks are really easy to plan across Europe, you simply book a flight and hotel and public transit will take you the rest of the way. I knew this trip would be something different. City living has gotten the best of me at moments (okay, a few times a day) and I wanted this trip to be wild, off the main roads and into some country I had never seen before. If you’ve ever looked at a map of the country, that is a lot of ground to cover. 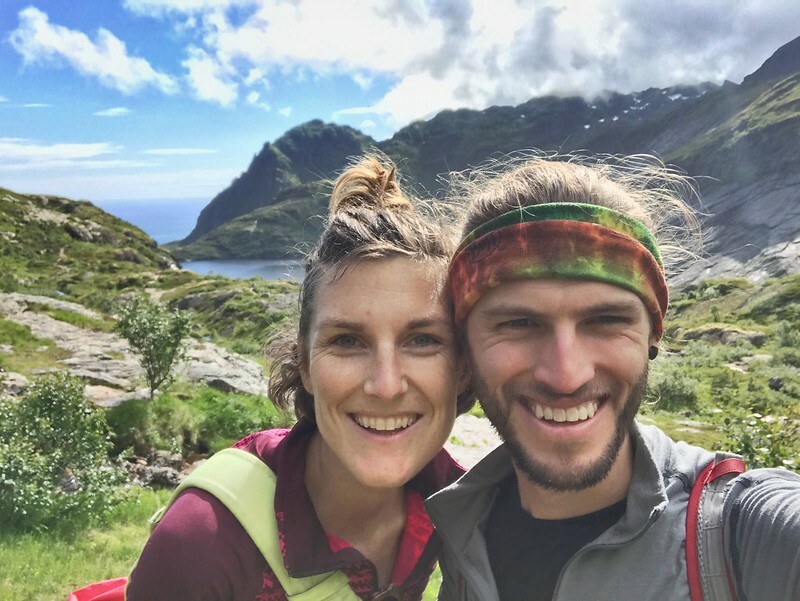 We ended up flying into Tromso, hiring our camper van (more on that in a minute), driving to Lofoten and back to Tromso, flying from Tromso to Oslo, hiring a car in Oslo to drive/camp to Bergen and flying back to London from Bergen. Whew. Given all of the moving pieces, I was a bit apprehensive as we locked up our flat for fourteen days. We had strategically packed – both of us had a hiking bag and we had a collapsible bag full of food and gear. Our plan was to eat most of that food so that we wouldn’t have much of a bag to bring back and wouldn’t have to buy all of our groceries at Norway prices. When we landed Tromso, we had just the feeling we were dreaming of. We felt like we were in another world. It was 9 pm and light as day, there were mountain views from the airport and a nice light drizzle. The air was crisp and the luggage was more hiking packs and fishing gear than roller-bags. Off to a good start. So, with that elaborate intro, here is my top ten from our time in Norway. Sleeping and traveling in our campervan. 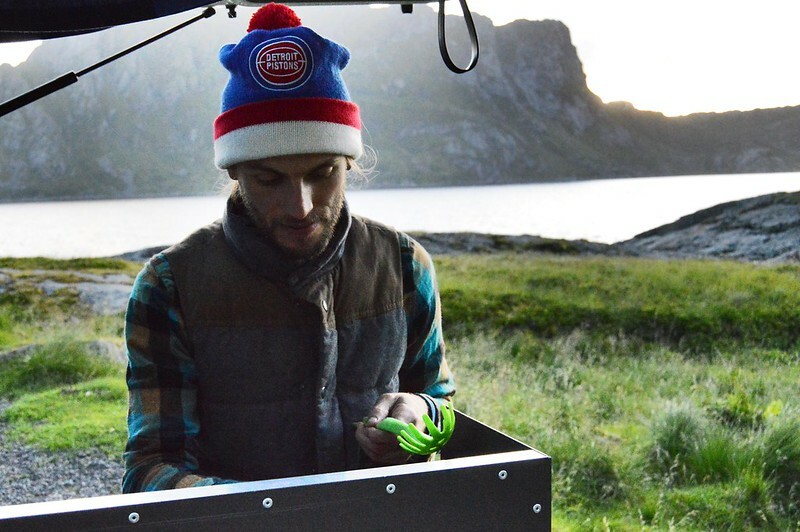 We hired our campervan from Arctic Campers and, man, was that the right choice. The owner greeted us on arrival with his little son in tow. It was 10 pm. We drove to a spot he recommended to sleep for the night. Here is Chris making dinner at 11 pm. Our little van was just what we needed. It was easy to navigate on the winding roads, we had a full size bed and ample cooking area in the back (stove, electric fridge and food storage). It was also discreet. We struggled to go to bed at a normal time given the light so often we’d be up until two or three am, wake up at nine and then take a nap mid-afternoon. We could easily pull over and take a snooze and no one was the wiser. 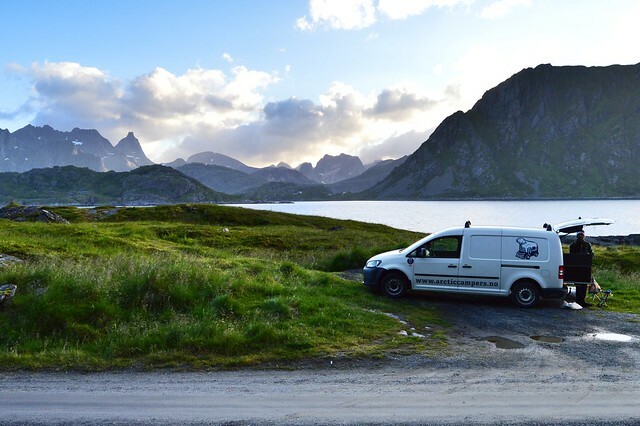 Bumming around the Lofoten Islands. 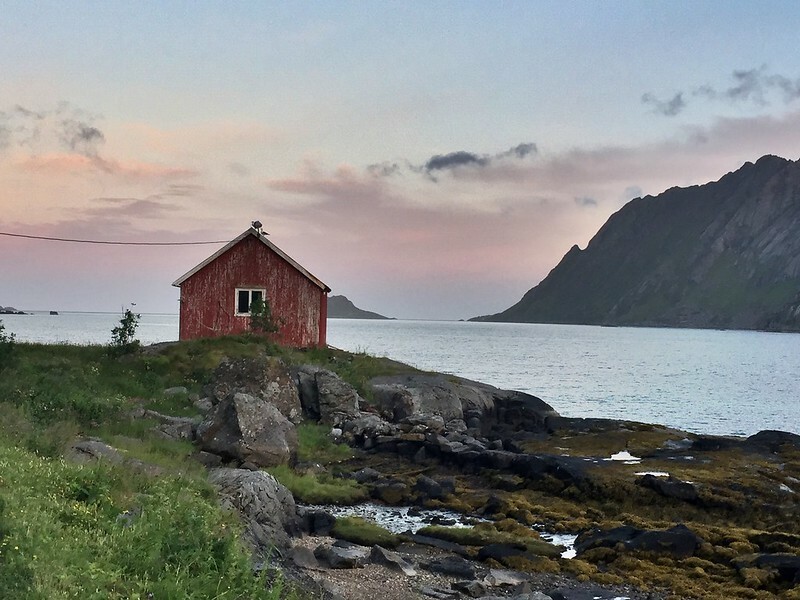 I’ll admit that my desire to go to Lofoten was solely based on Instagram pictures. Accessing each of these islands is through a complex network of tunnels that burrow under each fjord. Some of them were well over 10 km which was crazy. We spent the majority of our time in the north here and we didn’t really want to leave. The sun never set, the sea was always within view, mountains were at every turn. Thanks to our campervan, we had no clear agenda and no desire to create one. Filter Coffee aplenty. Outside of America (insert coffee snobbery), the idea of “filter coffee” doesn’t really exist. “Would you like an espresso?” “No, I’d like a cup of black coffee.” “Oh, I’ll make you an Americano.” Nope, not the same as black coffee. Anyway, we’ve struggled to find coffee to our liking across Europe, but Norway knows what’s going on. There was filter coffee everywhere. We could stop and fill up on petrol and get a massive cup of black coffee! It was also the only thing that was fairly reasonably priced and since we did quite a bit of driving, it was necessary. Drinking water from whatever stream was nearby. Our “Arctic Camper man” told us that we could drink from any flowing body of water. This caught me off guard a little bit. I couldn’t believe that we wouldn’t need our water filter. But true to his word, we were able to drink from any stream we found that looked halfway decent. This made hiking and touring around much more delightful and the water was absolutely incredible. Cold and so refreshing. The Midnight Sun. In the planning of this trip I had read a lot about the midnight sun. Essentially the northern Norwegians endure a “polar night” from November to January in which the sun doesn’t rise at all. The opposite is also true, the “midnight sun” period lasts from May to July in which the sun doesn’t set. We were fortunate in that the weather was pretty clear while we were there so we were able to witness the “setting” of the sun most evenings. It looks to be setting, slowly inches towards the horizon, bumps the horizon and then continues upwards. This does a number to the body clock. I felt like I had never-ending energy. I could run at midnight! We could begin a hike at 7 PM! Rock Climbing. We’ve been climbing in fits and starts for a bit now, a session here and there in the climbing gym but we wanted to get outside to climb. We hired a guide and happened to schedule it for the most blustery, rainy day we had the whole trip. Luckily our guide knew what he was doing and took us to a spot different from what we had scheduled that was still blustery, but sunny! 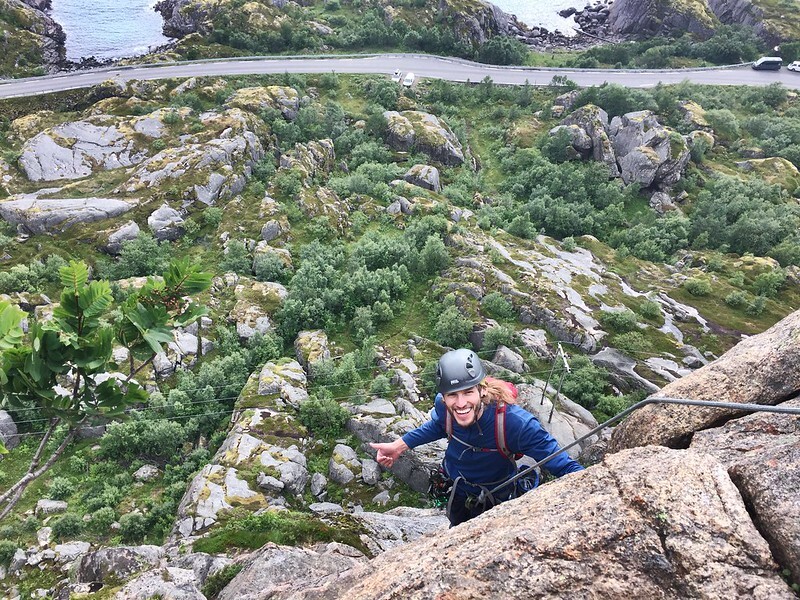 We had incredible views of the fjords and gained some confidence on the rocks. You can have your Eggo. Bergen. 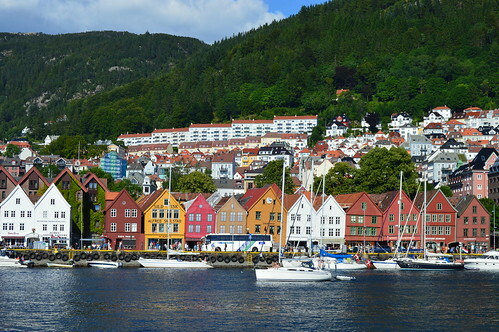 We were told Bergen is amazing and it held up to it’s promises. Sure, a pastry will cost you $15 and if you want a beer, you’d better start saving for it as responsibly as you would for retirement, but the views, architecture and water was well worth it. We did a lot of lovely walking around the city and took a Fjord tour on a perfectly sunny day. Henningsvær. This was the cutest, tiny town there is. 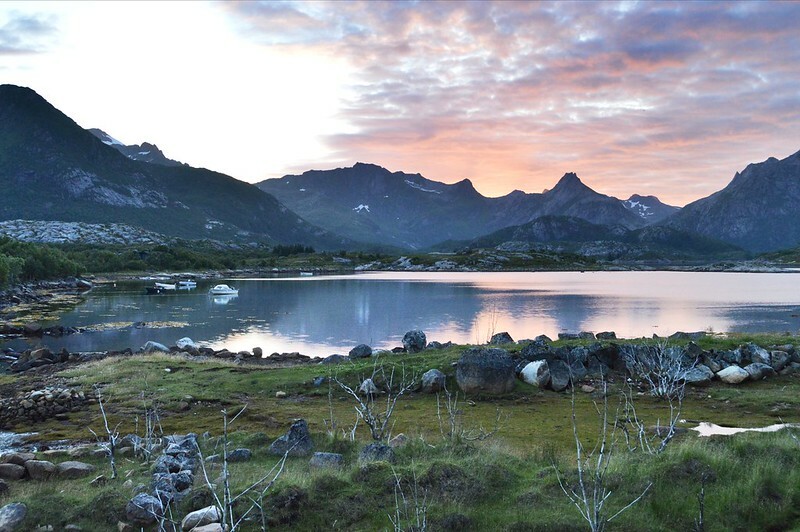 It is on the Lofoten Islands and was one of our first stays on the islands. We went for an after dinner walk at 12:30 am and the town was out and about. Bars and restaurants were wide open, live music floated across the water and it seemed like the ideal village to escape to. Submitting a mountain. The fjords were our priority but in the southern part of the country we were able to summit the highest mountain in Norway, Scandanavia and Northern Europe was pretty cool. 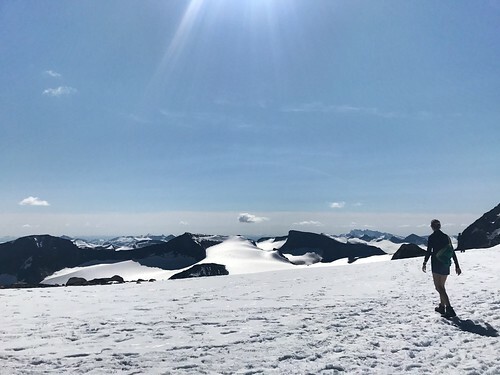 Galdhøpiggen had far too many false summits for our ill-inclined legs but the summit views, sunburn and snow sliding down made it worth it. Love this! Thanks for the synopsis and photos.